As the year is winding down, the Fifth Graders are getting a little anxious, so to keep them engaged and interested in science, we created a few science experiments relating to the rock cycle and weathering. The first experiment was with water and M&M's. The students stirred one cup to show how weathering affected the M&M. 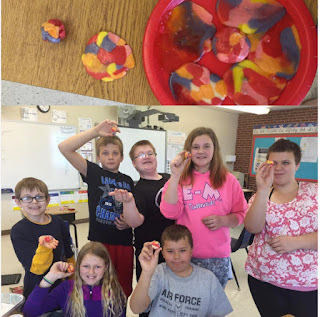 The second one the students did was showing the different types of rocks; Metamorphic, Igneous, and Sedimentary. They cut Starbursts into pieces and molded them together to show Sedimentary rock. After they molded those together they pressed the Sedimentary rock until it was flat, creating a Metamorphic rock. We then put one of them in the microwave to create an Igneous rock. The students really enjoyed this hands-on activity and learned so much while doing it.